Following case studies have all fictitious charecter. 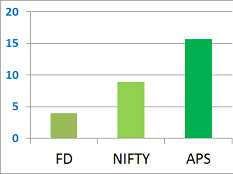 However, name of the stocks and their price in given time frame are correct. These case stidies have purpose to illustrate how a alert based system can help investors in cutting unwanted loss as well as prviding hint for entry point. Scenario 1: Mr. Murthy is a retired officer from a PSU. After retirement (Oct.2010) he invested some part of his money in equity market. As safe guard he chose only blue chip companies' stocks. After one year he reviewed his portfolio and to his surprise he had lost more than 48% in some of the stocks (like L&T). Mr. Murthy neither likes to visit stock market regularly nor to lose wealth by depositing in fixed deposit (Inflation is higher than interest rate). He is also skeptical about mutual funds as more than 70% of them fail to beat regular index and for underperformance, they charge upto 3% net management fees apart from entry/exit load. APS Solution:Mr. Murthy subscribed APS and did entry of all his transactions including L&T at buy price ₹1300. APS gave him pink alert on Jan. 7, 2011 and red alert on Jan. 14, 2011. He sold the stock at ₹1140 on red alert. Hence, he incurred loss of around 12%. He saved further erosion of 36% (Remember he has lost more than 48% without APS) of his investment money. Scenario 2: Ms. Rashmi Goyal is a software professional and working for a consulting company which has customers across the globe. During 2010 Deepawali muhurat trading she invested her received bonus of the year in companies which were doing well and the ones which were established leaders in their segment. Next one year she was busy at client site and working in different geographical clock time. She found time to review her portfolio only next year during Christmas vacation. To her surprise she had lost more than 75% in some of the stocks (like Jet Airways) during the same time. She had made profit in many of the stocks but few stocks which went bad ate away most of the profit. Even if she would have reviewed her portfolio once in between that would have made big difference in final figure. But, question was how and when? She is perplexed. 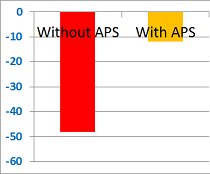 APS Solution: Ms. Rashmi subscribed APS and registered all her transactions in the APS system. She bought Jet Airways at average buy price ₹ 800. APS gave her pink alert on Dec. 30, 2010 and red alert on Jan. 18, 2011. At red alert she sold of the stock at price ₹625. She incured loss of 22%. She saved further erosion of 53% (Remember she lost more than 75% without APS) of her investment money. Scenario 3: Mr. Ankit Shah is in business of diamond cutting and polishing. He also invests in stock market but he is too busy to analyse stocks himself. Often he invests according to tips provided by his broker. 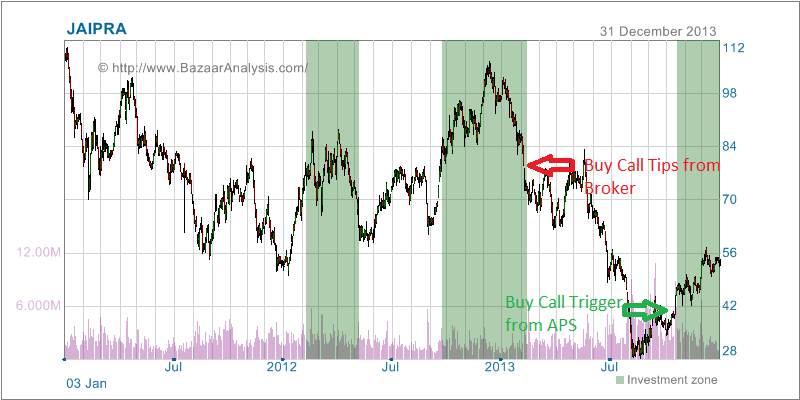 In the first week of February 2013 he got one call from his broker to buy JP Associates. 'This is NIFTY stock and it has sound fundamental' was justification of the broker. At this moment this stock is available at very cheap price (Rs. 75). 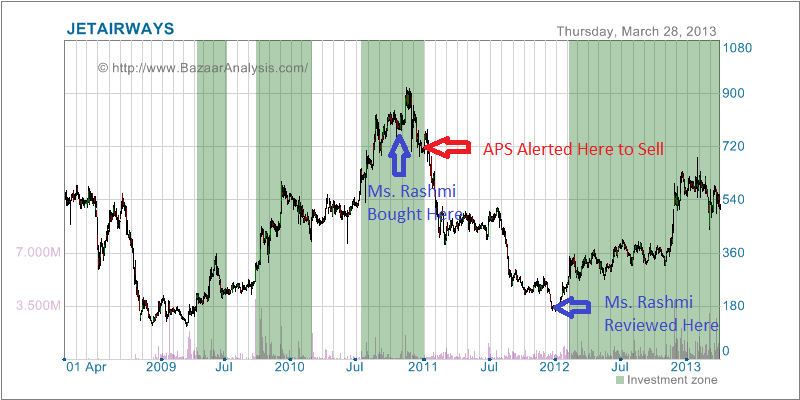 Mr. Shah invested significant amount of his money on this stock. At end of the year 2013 the stock was trading at Rs.55. Noticeable data point is the stock has doubled its price in last 5 months. However, Mr. Shah is still in loss of 25%. 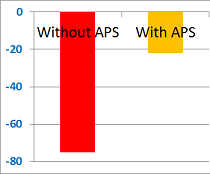 APS Solution:Mr. Shah has subscribed APS. He registered JP Associate in his portfolio (without actual buying) after getting tips from his broker. APS weekly report on 18 Oct.2013 alerted him for buying opportunity. He bought the stock next day at Rs.47. At end of the year he is with 15% profit for just 2 and half months investment (rest 8 and half months his money was earning saving account interest). He knows APS is watching his investment and it will alert for any change in trend at appropriate time. So, he has nothing to worry about. Scenario 4: Ipsita Ray is a budding actress. In the past she invested her surplus income in many business on personal approach basis. Unfortunately she had bad experience of getting cheated most of the time. Apart from her busy schedule she has no penchant for mathematics to calculate and analyse her finances. She knows stock market is the ultimate investment vehicle but the question is how to ride that? 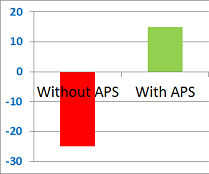 APS Solution: Ipsita came to know about APS in August 2013. She invested Rs.100000 on trial basis in stock market by help of Auto Suggestion feature of APS. Her first transaction date was 08 Aug. 2013. She just followed weekly instructions provided by APS. It was just like checking her email and Facebook accounts. In six months duration she has earned more than 15% interest on her investment. This is better than market index (NIFTY) growth 9% and much better than fixed deposit return of 4%. 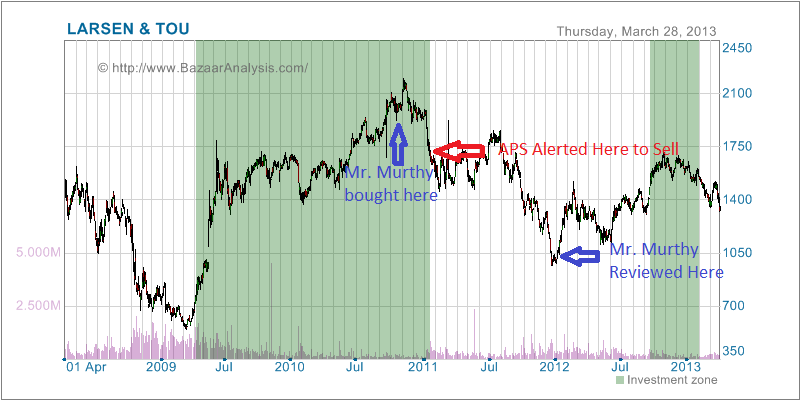 APS works as watch dog for investors who have taken exposure in stock market. It alerts on moment when stock start sliding down confirmed by statistical evidence. It also works as help to new investors in identifying right stocks and building balanced portfolio. It provides alert in buy direction too. Investors receive alert for a stocks registered in their portfolio when it starts moving upward.